It's hard not to be inspired by the artists and makers of the Cleveland Flea. Brilliant, talented, creative. They're tough as bleepin' nails on their ways to making their dreams come true. We began The Maker Series to take a look — behind the scenes, beyond the booth — to see what drives our makers to do what they love and love what they do. 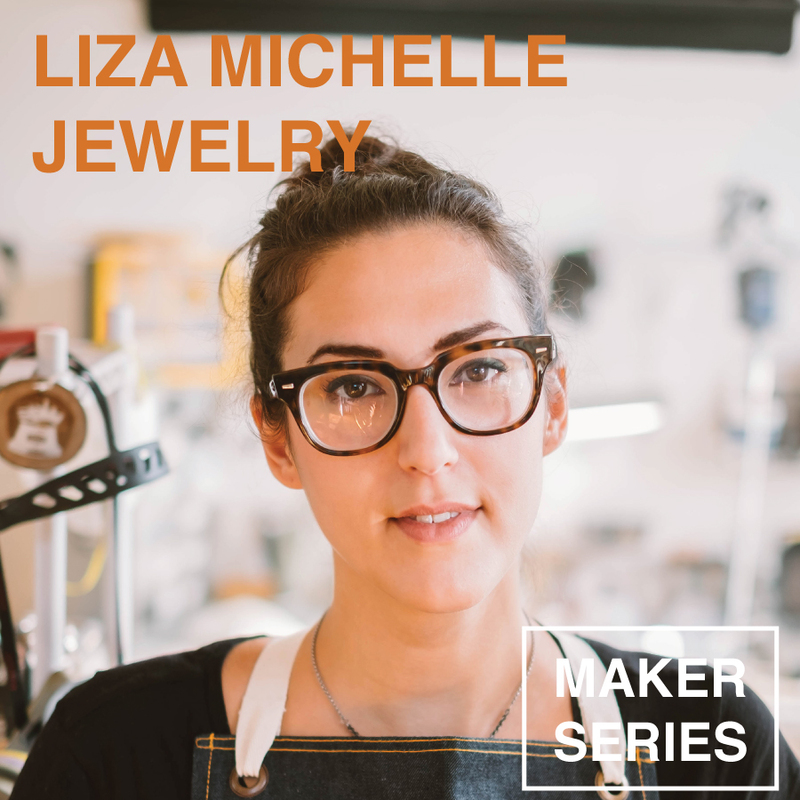 Liza Rifkin runs Liza Michelle Jewelry, a local-to-Cleveland handmade business that creates thoughtfully crafted, future heirlooms for you and your home. Using recycled materials, ethically sourced gem stones and green studio practices, every piece is handcrafted with care and attention. We've been lucky enough to watch Liza's business grow over the course of its life, and we are consistently impressed with how conscientious and driven she has become as both an artist and business person. Somehow she remains unburdened by the entrepreneurial pressure, still finding a place in her business for one of the most stressful niches of them all: custom bridal work. Read on for more insight into her process, and how she incorporates her "Nature Girl" persona into her products. Liza Rifkin: LMJ is a handmade jewelry business located in the Ohio City neighborhood of Cleveland’s west side. Every piece is carefully planned, skillfully built, intentionally finished, all by hand. I have a bachelors degree in fine arts with a concentration in metalsmithing that lends me the expertise to execute my designs. My work is inspired by my surroundings and a yearning for a more natural and green environment. I use only recycled metals, ethically sourced stones, and responsible studio practices, imparting as little additional harm to the environment as possible. Its so important to me to imbue my work with the careful attention and subtle beauty I find so inspiring in the natural world. To emulate nature's boundless creativity, I cast each object I forage or grow in solid sterling silver, gold, or bronze. This creates an exact replica of the item, ensuring every one of my designs is one of a kind. I love the excitement my customers experience when they discover their favorite twig or succulent that they can wear everyday. CF: What are your roles in the business? LR: I have about a thousand different hats in this business, as I am a one woman show over here. My main duties consist of running the business from an operations standpoint, all designing, fabrication and metalsmithing, and cat wrangler to my studio mascot, Sophie. CF: Why do you love what you do? LR: I love it because it’s like second nature to me, I thrive when sitting at my bench thinking up the next idea. There’s nothing in the world I could see myself doing differently, and I find passion and inspiration in my work everyday. I also never expected the kind of following I’ve received from my customers. They have such a confidence in me to create meaningful jewelry for them, and many have become close friends. CF: Why does Cleveland need a business like this? LR: The thing about jewelry is it’s a luxury product. No one needs it but I think that its this universal constant for so many, and allows one to express their individuality. People use it to commemorate everything from engagements to memorials, birthdays to championships (GO CAVS!!). There’s a real tangible value in my work because I seek to make everything as unique and one of a kind as possible. It’s different from picking out a piece from a standard production line where everything is the same. From a commission stand point, having the skills and studio to implement any design allows me to cater to all of my clients needs and ideas. At the end of the day, my work is a product of my values and design sense, and I’m pretty darn proud of what I can think up, and my customers can attest to that. CF: What's the best / most difficult part of running your own business? LR: There are so many ‘bests’ in this life, from seeing customers excited about the work, being able to design the life I want to lead, and doing something I love everyday. The most difficult are the things that don’t come naturally, the operations side of it, but I love a good challenge! CF: What are your goals for the business this year? LR: I am pushing more custom work, with an emphasis on bridal. I absolutely love working with clients to design the perfect symbol for their love, as well as bridesmaids and groomsmen gifts. I recently gave a talk during Pecha Kucha describing the emotional rollercoaster of designing engagement rings. CF: How have you grown in the 2 years since we featured you last? LR: This is a crazy question for me. I still can’t believe I’ve been doing this work full time for over three years! In the past two years I’ve really zeroed in on my design aesthetic and have evolved creatively quite a bit. I love when customers who’ve been with me from the beginning tell me how much I’ve improved and how much they love the risks I take within my design process. I’ve grown the confidence to trust my gut when it comes to making business decisions and to try to never sweat the small stuff. CF: Did you see yourself growing up to be a jewelry designer? LR: As a kid growing up I was dead set on being a pediatrician. I tailored my academics to math and science, but never sacrificed the arts. My mom was the major impetus in my life to be creative, always supporting my art lessons and extremely messy craft projects. It was in high school that I discovered metalsmithing, and did a complete 180. I was hooked. From that point on I knew come hell or high water (or recession, or student loan debt) I would pursue my dream of being a jewelry designer. It’s been easy for me in that respect, because I never questioned what I was supposed to do, only how to accomplish it. CF: What's the first big moment where you knew you were headed in the right direction with your business? LR: When I lost my job, and I didn’t give myself the option to fail. I told myself I was going to run my own business, and have never strayed from that goal. LR: I have an incredible tribe on my side. I surround myself with people that inspire eachother daily to be better, work harder, and live more freely. CF: Have you learned anything about your business by participating in Cleveland Flea? LR: I’ve gained and maintained an incredible customer base. People know to find me at the flea, and are always excited to see what’s new. CF: What's your favorite piece of advice as it relates to your business? LR: When you don’t have the ability to do something to the caliber of your other work, find someone who can. Don’t be afraid to delegate. It all comes down to who you surround yourself with. CF: What's one thing people would be surprised to learn about your business? LR: Every single thing is handmade, down to the wire and sheet metal I mill out of my scrap! CF: How would you hope LMJ be described by your Dream Customers? LR: I’d hope the work would be described as quality, one of a kind and special. I delight in the fact that my customers can pick up on and sense the story behind the work, and the intent in creating it. CF: What's the most amazing thing you've ever made and why? LR: I don’t think I could ever pick out one thing. At the moment I am really really enjoying the process of making engagement rings, between the incredible materials, exciting designs created between myself and my clients, and the challenge of making something a bit more complicated than my available lines. CF: Anything you've made that you just couldn't sell? LR: I struggled with this a lot more earlier on. These days even though every piece is one of a kind, I find it easier to let go because I love the joy that my customers find when they pick out their unique piece. CF: What's your favorite booth(s) at the flea? LR: I really love The Social Dept. Andy is an incredible designer, and an even nicer guy! I probably own over 15 of his shirts. I’m also a huge sucker for anything vintage, Ampersand and Black Kitten Vintage are my go to’s. CF: What are your favorite spots in Cleveland for eating / drinking / exploring / learning? LR: I love hiking in the metroparks, taking my pup to edgewater, and hanging around my neighborhood of Ohio City. LR: Take a deep breath. You can handle more than you think, your smarter than you give yourself credit for, and mistakes can be some of the best teaching tools-so don’t freak when they happen!